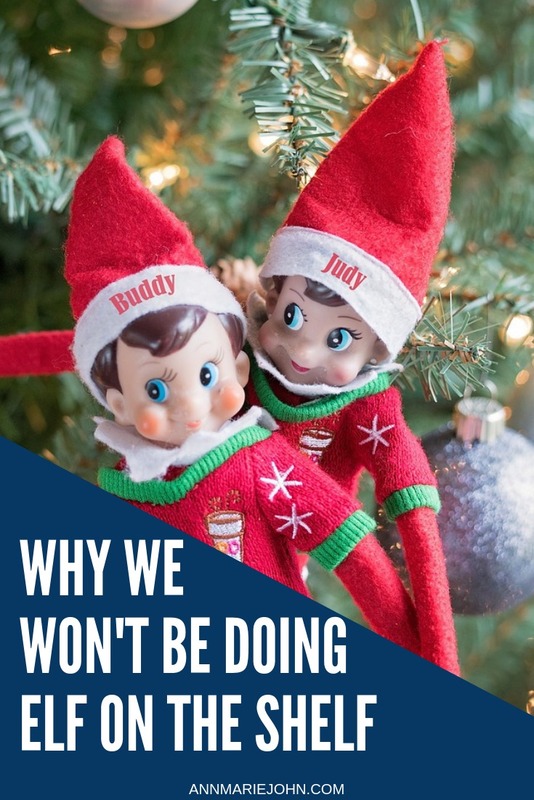 The Elf on the Shelf phenomenon hasn't dissipated over the years, and it's actually gotten a lot worse. It is now the thing that parents use to get their kids to behave so that Santa can get them that gift they've asked for. I have seen photos upon photos of these little Elfs causing mischief in friends homes on Facebook, and they are all over the web. While at first, I thought it was cute I no longer do. The Elf on the Shelf craze has taken over, and I think it's also taken over some parents as well. So while I don't judge anyone for doing what they do, here are my 5 reasons why we won't be doing Elf on the Shelf at our house. 1. Christmas is supposed to be about fun. 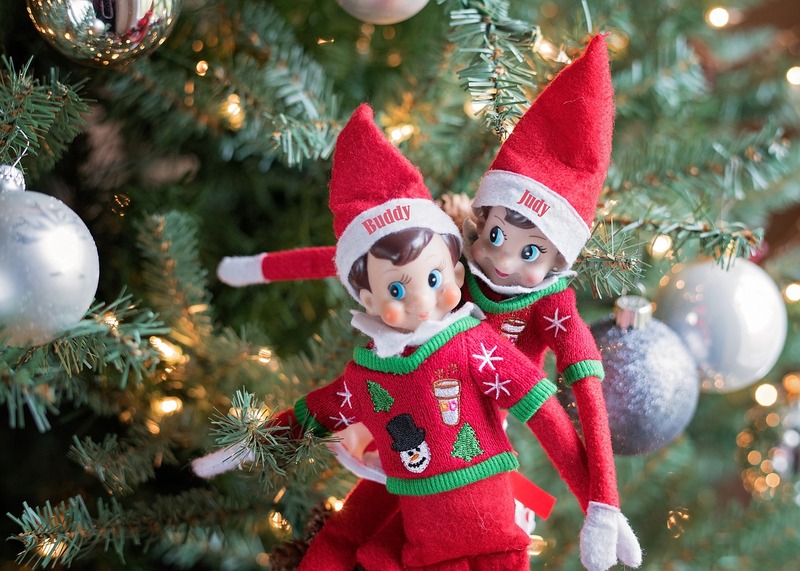 It is no fun having to wake up in the middle of the night and try and re-create some sort of mischievous act that these little Elves are supposed to be doing. I am not that creative, and while Pinterest gives me lots of ideas, I think I'm just too lazy to do them. I can also tell you that I forgot to move her at least 50% of the time I had her. It's also no fun telling a 3yr old that she can't touch something because guess what? SHE'S GOING TO TOUCH IT! 2. I want a good night's sleep! I would rather go to bed and forget about everything until I wake up in the morning. I don't want to spend the night tossing and turning trying to think of what elaborate trick I'm going to come up with the very next day. I also don't want to get out of bed once I finally fall asleep to put that trick into motion. Even when I get up, I would prefer not to have to clean up a mess that I made. Ain't nobody got time for that! 3. Are you kidding me? While it's all supposed to be in good sport, I would rather my daughter not be terrified thinking that because she did something wrong, that the creepy little Elf was going to snitch on her to Santa and she'd be on his naughty list. For someone who's supposed to be watching and making sure that the kids are good, they sure come up with some naughty things to do themselves. Kinda contradictory isn't it? 4. Am I the only one who thinks these Elf's are creepy? I would walk around the house, and it just seems like her beady little eyes would follow me everywhere with that smile forever on her face. It's like she's taunting me to do something. So Santa sees you when you're sleeping, and he knows when you're awake. He also knows if you've been bad or good. So why does he need an Elf to report to him? And guess what you little creepy Elf, do you know what happens to snitches? 5. I would rather just keep it simple. You don't do what you're supposed to do, and your Christmas will be canceled. I don't need an Elf to keep my kids in check, I can do that myself! JUST ASK MY KIDS! 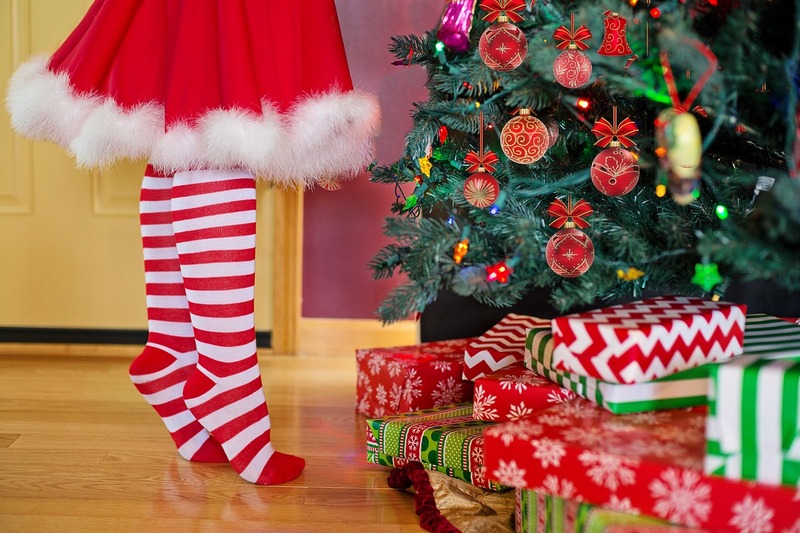 So let's discuss: Are you doing the Elf on the Shelf at your house? We do it and it brings my kids so much joy & happiness to see what shenanigans he got into. It definitely worth the trouble and effort. OMG I love this! I've always wondered why he was bad when the kids are supposed to be good. I'm not doing it at our house either. I don't think he was always supposed to be bad but he's just turned that way over the years. I would rather just deal with my kids the normal way. We do Elf on the Shelf but the simple way it started out, by the elf moving every night. I don't make it do naughty things because 1. that wasn't the actual intention when it was created and 2. why would I make it be naughty when I don't want my daughter to be? My little one really enjoys seeing where the elf moves every night. The first thing she does when she wakes up is search for it. Exactly Alexandra but see I didn't always remember to move her. When Madison was younger it was easier, but she's now at that age where you say "don't touch it" and she touches it. I would rather not traumatize her further, it's bad enough I'm going to have to explain that Santa isn't real eventually. Now the doll on the window sounds like a good idea. I've even seen the Grinch on the Bench. My daughter thinks the Elf on the Shelf thing is creepy too. She says if her kid ever wants it, then I am going to have to do it for them. Then I guess it's up to you then to do it with them. I'm sure you'll have fun with the grandkids doing it. I have seen a lot of the Elf on the Shelf posts on facebook. Looks like a lot of work. But some of them are really cute. Others... not so much. There are some cute ones Terry and then there's some that are just so creepy. Also a lot of people take it to the extreme. I would rather not be bothered. My teens thought it was creepy as well and Madison was too little (age 2) to really understand not to touch. It was a bit too time consuming having to do everything. These are some great points. We've never done this either. I didn't realize the idea was that the elf is always watching! Yes Liz, he's watching and reporting to Santa all the bad behavior so you better behave. I do still do it and really enjoy it, even though it can be a pain at times. Seeing my daughter wake up each morning, rushing around to find the elf makes it all worth it. I can completely understand those who don't want to participate. It really can get annoying when you forget to move the darn thing. That is amazing Theresa that you still enjoy it with your little one. Just seeing her smile will be worth the trouble I'm sure. We don't do this either. I think it's fun, though. I've met quite a few family who don't do it and it was fun when we first started but it started turning into not so much fun. Am I the only one who doesn’t know about this activity? From what I read, I rather not try it. We have sporadically been doing ELF on the shelf. We have done a little bit more this year, but it is definitely not a huge focus of my family. And it shouldn't be the main focus either. Maybe you'll either continue or stop completely. We're done. He sounds a bit nicer than our Elf. I'm thinking of starting a whole new tradition. We did not have an Elf on the Shelf when my kids were little. I have seen so many posts about it this year. It has become very popular. I can see how it would be fun to do. I would not use it as a way to make the kids behave. And you really shouldn't use it as a way to make the kids behave but a lot of parents do. We do Elf on the Shelf but very liberally and not fanatically like some people do. If he gets moved, he gets moved and if he doesn't, he doesn't. And that sounds like a lot of fun. I forgot to move him 1/2 of the times anyway while we had him. I've never got this Elf of the Shelf thing, I thought it was because I didn't have kids, but I'm glad to see it's not. I'm getting all of my nieces and nephews and godchildren the Christmas Pickle Tradition so they can have a simple, meaningful tradition on Christmas morning. I've heard about the Christmas Pickle and I'm truly intrigued. I'm thinking of getting one next year and sharing the story. Thank you. We haven't done it but Scarlet's friends have been talking about it at school so I know it's on her radar. We might next year, depending! I'll probably keep it mellow.